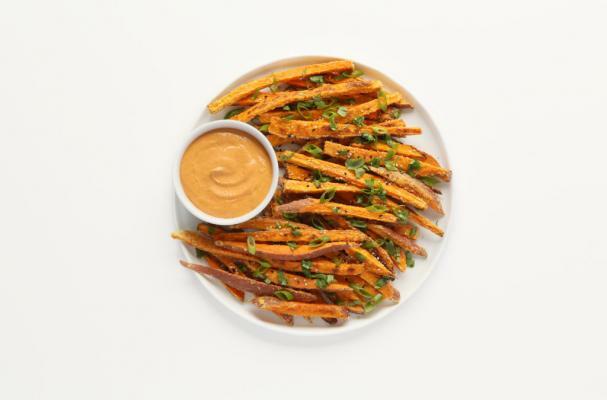 Sweet potato fries with spicy almond dip is clean comfort food that you don't have to feel guilty about. Sweet potatoes are rich in fiber and provide an excellent source of beta-carotene, vitamin C and potassium. This simple side dish can be served as a hot appetizer for a party, a healthy snack or a easy side dish. I love the almond dipping sauce as it brings a nice change instead of typical creamy dipping sauces. Step 1: Preheat oven to 425°F. Line a baking sheet with parchment paper. Step 2: For the fries: While the oven is heating, lightly rinse and pat dry the sweet potatoes with a dish towel and cut into 1/4” matchsticks (use a mandoline if you have one). In a plastic bag, toss sweet potatoes with the oil . Add the almond flour and salt and pepper. Place the potatoes on the baking sheet in a single layer, making sure each fry has enough space and they aren’t touching. Place the jalapeno on the sheet alongside the fries, but not touching them. Step 3: Bake for about 30 to 35 minutes, flipping the potatoes halfway through, until sweet potatoes are tender and start to turn golden brown. Remove from oven and sprinkle with another pinch of salt. Step 4: For the dip: Cover the chiles in a small glass bowl with boiling water. Let soak until they are completely soft, about 10 minutes, and then drain the excess water from the bowl. Place chiles in a blender with almonds, oil, lime juice, salt, garlic powder and onion powder until smooth, about 2 minutes. Step 5: After the fries have slightly cooled, add them to a platter and top, if desired, with sesame seeds, scallions, cilantro, jalapenos and lime wedges, along with a small bowl of the spicy almond butter for dipping. Note: If you can’t find whole dried chiles, substitute ¼ to ½ teaspoon ground pure chile pepper, such as arbol or chipotle. You may need to add 1 or 2 tablespoons warm water to help puree the nuts. For a sweet addition, add a side of sliced pears alongside the fries, for another dipping option. Optional: Substitute the fries for red peppers for a sweet and spicy addition.